REFSQ 2015 is over and has been a great success. Next REFSQ will take place in Gothenburg. We will be delighted to welcome you in Gothenburg for REFSQ 2016. Visit the REFSQ 2016 web-site for recent calls and information! The REFSQ 2015 proceedings are be published in Springer’s LNCS (Vol. 9013) series. Olga Liskin – “How Artifacts Support and Impede Requirements Communication”. Why YOU should attend REFSQ’15? Have a look at the REFSQ’15 trailer! 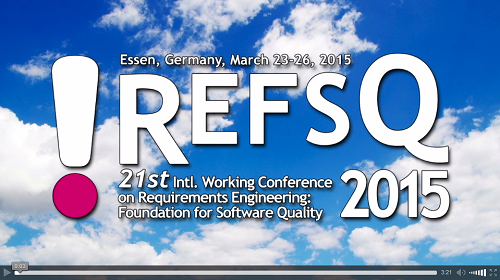 The REFSQ working conference is the leading European conference series on requirements engineering. It is the goal of REFSQ to foster the creation of a strong European RE community across industry and academia. Since 1994, Requirements Engineering continued to be a dominant factor influencing the quality of software, systems and services. REFSQ seeks contributions which report on novel ideas and techniques that enhance the quality of RE’s products and processes, as well as reflections on current research. REFSQ has a long tradition of being a highly structured and interactive forum. The special format of each session includes the three roles presenter, discussant, and session chair, yielding into highly interactive sessions, filled with discussions among the excellent researchers and industry experts. In addition to the high-quality scientific program, REFSQ also features a highly interactive Industry Track, Workshops and an for the first time a Research Methodology Track. With about 570,000 inhabitants, Essen is one of Germany’s ten largest cities. During the last century the Ruhr city became above all known for having the largest coal and steel industry on the European continent; it is much older than Berlin or Munich and even at that time could look back on a 1000 year history. “Change through culture – culture through change”: the theme that palpably characterises the entire region and the city of Essen has also convinced Brussels. Essen, along with the Ruhr District, has been nominated by the European Commission as the European Capital of Culture of 2010.